Electronic Arts and Big Huge Games announced today the first downloadable content pack for Kingdoms of Amalur: Reckoning, "The Legend of Dead Kel", will be arriving on PlayStation 3, Xbox 360, Steam and Origin beginning March 20. The new expansion will add a new continent for players to explore, the island of Gallows End, and a new story arc which takes place there. In addition, the pack promises numerous sidequests and a new player residence, an estate consisting of multiple buildings and retainer characters (all with their own character histories and personality). Sounds like a healthy bit of content. Big Huge claims that Gallows End constitutes an 15% expansion of the game's world, which was already pretty well packed with things to do. 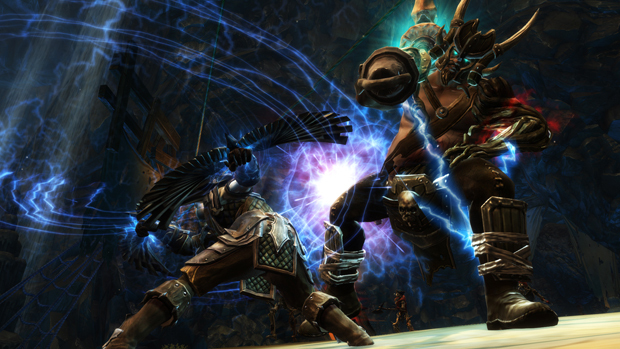 Will you be ready to take on still more of Amalur next month?